I wanted to make some cookies for a get together at a friend's home recently. I was looking for something different and possibly seasonal. 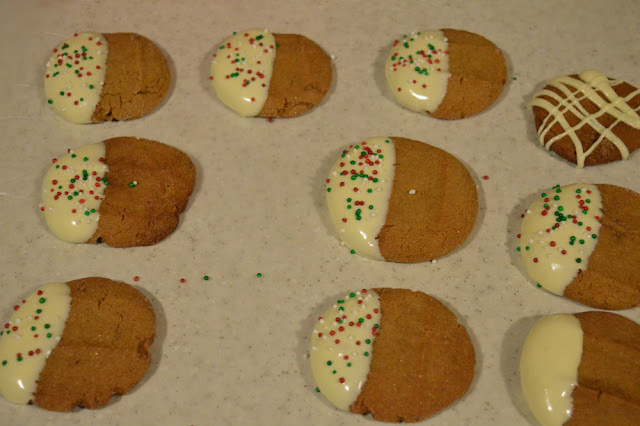 After scouring my recipe books and scrolling through Pinterest, I decided to try making ginger cookies. I've never purchased molasses so I've never made any sort of real gingerbread recipe. 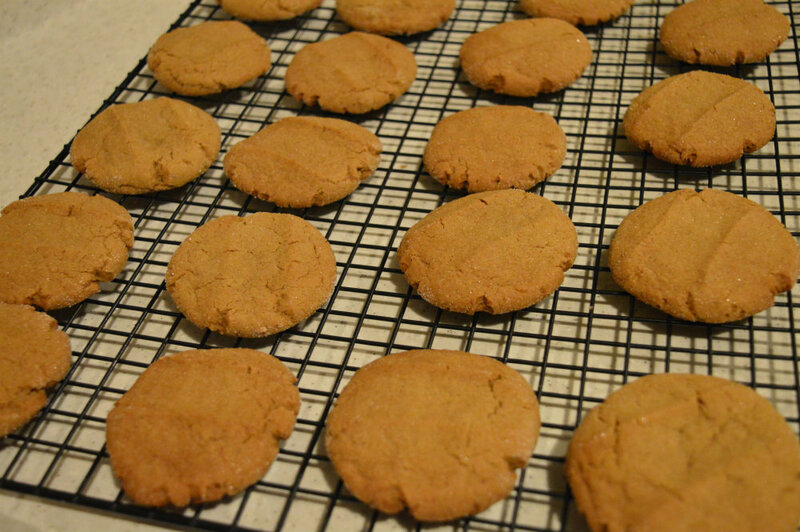 Well, after the success and deliciousness of these cookies, molasses is going to become a baking staple in my cupboard. 1. Whisk flour, baking soda, ginger, cinnamon, and nutmeg in a bowl. Set aside. 2. Cream together butter, granulated sugar, and brown sugar until well blended. I used my stand up mixer with the paddle for this step. Mix in the egg and then the molasses and vanilla extract. 3. With the mixer on low, add in dry ingredients until combined. Cover bowl and chill for a minimum of 1 hour. 4. Preheat oven to 350 degrees Fahrenheit. Scoop dough out and shape into balls. Roll balls in granulated sugar and flatten slightly on greased baking sheets. Bake for 8-10 minutes. Cool on wire rack. 5. Once cookies are completely cool, melt chocolate chips in microwave in a microwave-safe bowl. I added in the chips a little bit at a time and microwaved in 20 second intervals and stirred vigorously in between to prevent burning the chocolate. 6. 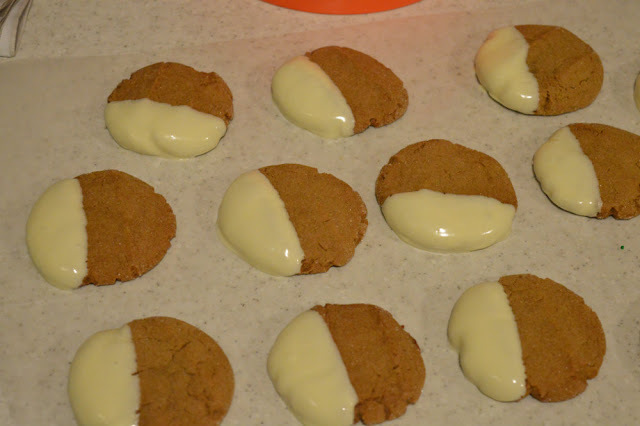 Once you have the consistency you like, dip cookies in white chocolate and place on wax paper to dry. If you want sprinkles, add them at this point while the chocolate is still wet. 7. Let the cookies harden completely before packing them in a container. You may want to put the cookies in the refrigerator to help harden the chocolate. These are by far one of my favourite ginger cookies I've ever had. Slightly chewy and very spicy. The chocolate adds a nice bit of sweetness to them, but I think the next time I make these I'll omit the chocolate. 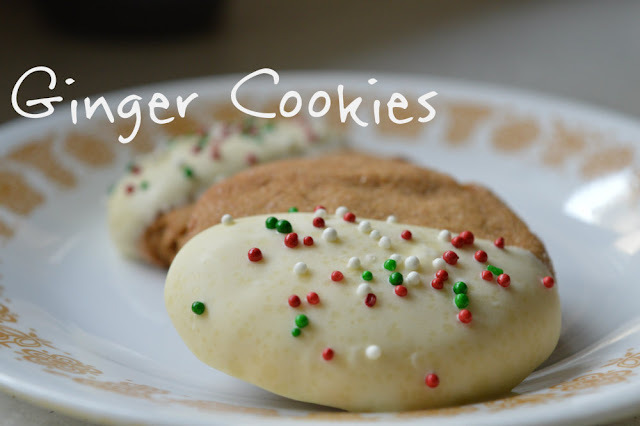 They're the perfect compliment to a cup of coffee or tea. And now that I have leftover molasses on hand, be prepared for all the gingerbread recipes! I love molasses in cookies! 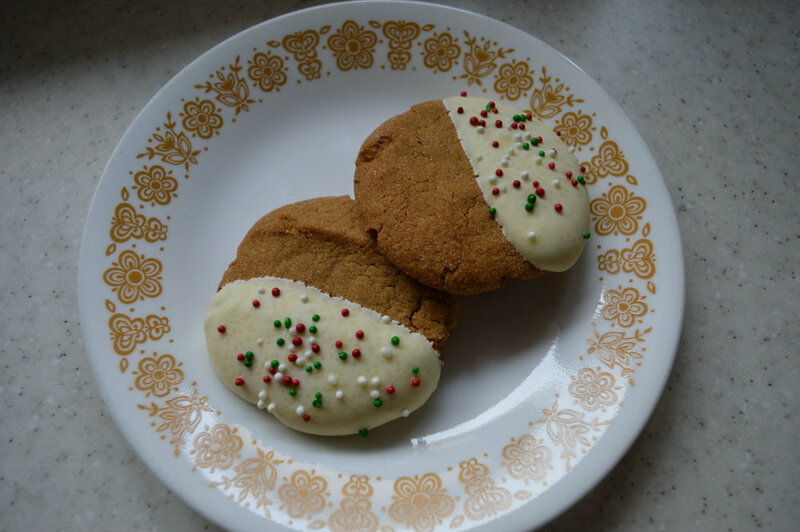 I used to make these molasses drop cookies that were like little pillows of delicious. Mmm well that sounds heavenly.